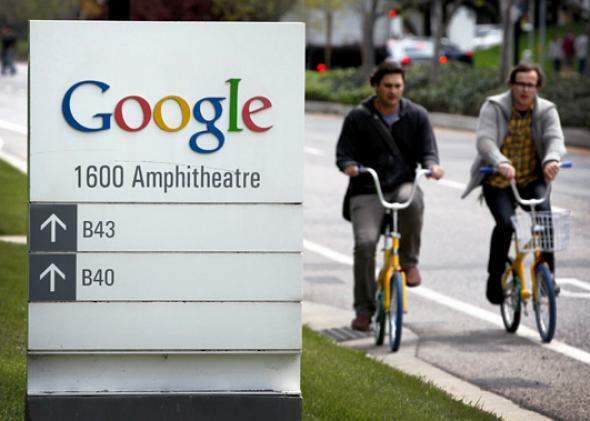 Google stock tops $1,000 thanks to online ad business, not moonshots. Google is known for moonshots, but its business model remains pedestrian. Google is a wildly innovative company. Rarely in the history of capitalism has a firm pioneered so many different technologies at the same time, from self-driving cars to wi-fi balloons to artificial intelligence. As a technology company, Google is endlessly fascinating. You might think that this innovation has a lot to do with why Google’s stock soared past $1,000 a share today for the first time, bringing its market capitalization to some $333 billion. But it doesn’t, really. As a business, the reasons for Google’s success remain surprisingly boring. In short: It sells a ton of online ads. And it’s selling more every day. Yes, Google also runs YouTube, Motorola, and the Android operating system, and it’s on a crazy quest to map everything from the Great Barrier Reef to the inside of the Mall of America. And all of those aspects of its business, along with its Google X “moonshots,” play into the company’s valuation. But what Wall Street’s elated reaction to its third-quarter earnings results shows is that Google is still, at its core, an online advertising business. I wrote this week about how Google hit on its original business model, auctioning paid advertisements alongside its search results. It now auctions paid advertisements a lot of other places on the Web, too. But it’s remarkable that even today, with Google’s hands in so many different sectors, the metrics that are driving its growth are still paid clicks and cost-per-click. Cost-per-click has been down of late, which is why Google’s stock had been stuck around the $900 mark for a while. That’s because ads on mobile devices aren’t yet valued as highly as those that people view on desktop computers. But the new earnings report shows that the company is more than making up for the decline in average cost by getting people to click on more ads than ever, including on their smartphones and tablets. In short, the algorithms that Google uses to target its ads are working better than ever. The enormous profits that Google reaps from its ad business are, of course, what allows it to take those moonshots. Come to think of it, it’s a little reminiscent of how automotive ads and classified ads once subsidized newspapers’ remarkable efforts to cover world events in depth and conduct months-long investigations uncovering injustice and corruption. Wonder if there’s a correlation there?